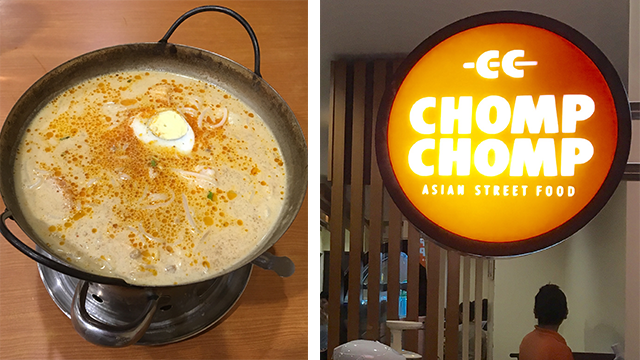 Chomp Chomp has not only perfected its recipe of the stand-out dish and all-time favorite Singapore Laksa, in its nearly five years of existence. Having a lot of suki, it has also developed a remarkable connection with its customers, who all commonly love one thing about this Asian fusion restaurant: how hearty meals with huge serving sizes could also be so tasty and affordable. In January 2012, mother and entrepreneur Ana Lao Tan took the risk and opened her second restaurant, Chomp Chomp, in Malate, Manila with one thing in mind: the students. “I wanted to be assured that when it’s my daughter’s break, she’ll have somewhere to go na ok. I was thinking of the students. As a mom, I want them to eat good and affordable food,” said Tan. “It was more of an opportunity to take,” said Iris about her mother’s startup business. Chomp Chomp is the second branch of the Bugis-Chomp Chomp chain of food establishments, having three other branches in Ortigas, near CCF Tiendesitas; Kapiligan, near UERM; and Katipunan, near Ateneo. All branches offer a variety of Singapore-inspired dishes, ranging from popular Singaporean food like Nasi Lemak, Hainanese Chicken, and Nasi Goreng Rice. They also offer rice meals and noodle soups, including the best-selling Singapore Laksa, all individually served in a hot pot. There’s also the Nom Noms on Stick—clean street food like squid balls, crabs balls, crab egg rolls, and others for only Php 35 per stick—which students love to take out and eat for their snacks. While her husband manages the family business, Tan is an accountant and teacher by profession. She did not have any formal training when it comes to running a business or cooking, but she loved to experiment with different recipes. “Whenever she nailed a dish, she would share it to family and friends,” her eldest daughter Iris shared. Ira, on the other hand, was always called to taste the food their mom would cook as all their recipes were formulated at home. Ira would then know if a certain recipe lacked flavor or needed to be improved. It can however also be a rewarding experience. Ira saw the business grow through the support of their local church. “The first branch was in Quezon City. We didn’t have many customers at first, but because we had our church near it, church people would always be there every Sunday to support. We’re really thankful for that, and slowly, through them, our business grew a name,” said Ira. What they believe to be the business’ strongest point is the management, with its owner being very patient and hands-on in all aspects of the business. People saw her treat every branch like her own baby. “I haven’t seen anyone who’s gonna wake up at 6 AM and be there, wala pang tao, minsan mauuna pa siya sa staff, and she’s already there checking everything from the kitchen to the whole restaurant. The business is her baby and she doesn’t want anyone else taking care of it other than herself. She’s that hands-on. Even if other people are there to look after the business, she has to be there as well.” said Ira about her mom. Iris saw how her mom oversaw kitchen activities, closely monitored transactions, and really sat down with the customers to listen to what they had to say—both good and bad. They consider those comments to have contributed much to their improvement in the business. “We have to be consistent in what we do well and change what customers don’t like,” Iris said, further explaining that they aim to grow a business that supports people and serves affordable and filling meals, and to be able to share to them a humble testimony. “Mom would always say that we have an invisible partner, God, who would always make sure that the business does well,” Iris related, also stating that they pray about their business, which they envision to grow to have more branches and other related businesses like food distribution and catering. They have recently fixed a delivery service around Taft Avenue which especially targets students who live in dorms or condominiums, as well as residents who do not feel like going out to buy food. “We tried our luck by risking a bit and we’re just grateful how God has been gracious in guiding and providing,” said Iris.